This is a 10 day event that always starts on the 2nd Friday of October. It started in 1957 and has grown to become one of the largest festivals in the country. Over 2 million visitors are estimated to visit Parke County during this county wide event. 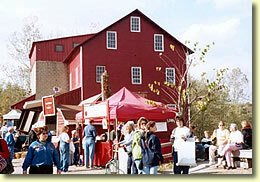 The Historic Bridgeton Mill is one of the main attractions of the festival, well over a million people visit this small town during those ten days. There are over 700 Arts, Crafts, Antiques and Who Knows What booths in the town of Bridgeton for this 10 day event. 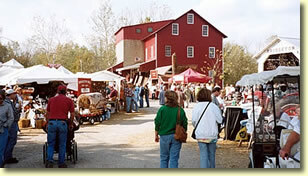 The mill property has over 140 booth spaces that are located around the covered bridge and mill. or email us bridgetonmill@gmail.com for more information !